This Giveaway is closed. 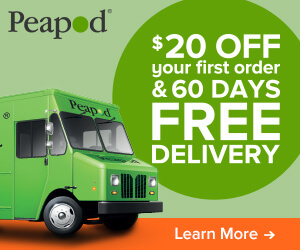 As we’ve mentioned before, we’re huge fans of Peapod Grocery Delivery by Stop and Shop. Since I do shop at Stop and Shop regularly, I love that I can buy products on Peapod.com that my family loves and uses. I really try to buy organic as much as possible, so their Nature’s Promise line is what I buy most of the time. I love the convenience of ordering from my laptop or iPhone (using their handy app) and having it delivered the next day. As I’ve mentioned before, with working and not having the car during the week, I depend on Peapod to keep my pantry and fridge stocked. Peapod actually came to my rescue this past week. I’ve been away the past two weekends and things have been very busy. Next week I’m having sinus surgery so I need to make sure I prepare several meals that I can keep in the freezer for dinner for my family. I ordered from Peapod on Monday afternoon and had my order by Tuesday night. Since I do order regularly, I really like that they have this new “Order Genius”, which fills in foods I purchase often so I don’t have to manually search for it every time I order. I’ve noticed, for the best chance at picking your delivery time, order as early in the day as you can — or even two days in advance. This means I can pick a time when I can get $ off my order for picking a longer window (it’s greener too). I saved $3 by picking the 4:30 to 10pm time. While my order ended up coming at 10:20pm, Peapod actually called me and told me it would be coming at that time. I was pleased, because they cared enough to make sure I knew. I was able to stock my husband with bagels. And get ice cream for my kids. As well as pick up my favorite items from Nature’s Promise. I love the grape tomatoes and the wild caught fish. I picked cod this time, I usually get the Sockeye Salmon. Check out my grocery delivery haul from Peapod. 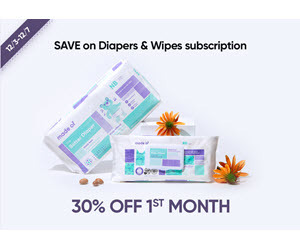 Peapod accepts valid manufacturer coupons. Peapod will double up to 99¢ per coupon unless otherwise specified on the coupon. You can save even more with exclusive online coupons. While shopping online, you’ll see exclusive offers which’ll be applied as you add these items to your cart. -Peapod shoppers hand select your produce and meat, so you’ll be sure to get good quality produce and meat with your order. Giveaway is closed and a winner was notified. Previous Post: « Strawberry Shortcakes Donuts Recipe – Inspired by Strawberry Shortcake, Herself! I would buy a wide variety of groceries. I would order their organic fruit and vegetables. I would get a lot of produce and items for a barbecue. I love all the organic food! And the ready made meals! Also…Moose Tracks?! Yes please!! I would get all sorts of items, snacks, produce, pasta, etc.. I would order fresh produce. My kids luv eating fruits. Thanks for the chance to win! I would love to get some meat from them. It looks like they have great sale prices. The prices are excellent. I try to buy organic, so I am thrilled that I know exactly what I buy, since I also shop in store. I would love to try pea pod! I love that it is convenient and fresh! I love their selection of fruits and vegetables! Macaroni, rice, everything! Even frozen food comes delivered frozen! I love Peapod! I started using Peapod last spring . It's very handy when you can't get out to the store for whatever reason. Once you have placed an order or 2, there is a tab to show you which of your favorite items are on special, which I find very helpful. In addition, there is often a $5 off coupon on Facebook or Twitter. I love that I can shop the weekly Stop and Shop sales using Peapod.